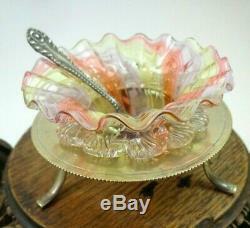 This three-piece art glass master salt with silver plated stand and spoon is a spectacular example. 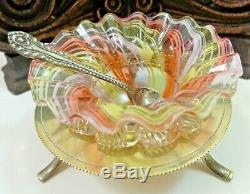 The art glass master salt colour combination is a rarity with three ribbon colours of apricot, yellow and purple. There is also a Peloton decor of white threads throughout the ribbon colours. The applied prunt and petals are colourless glass. Very hard to find an example in this shape. 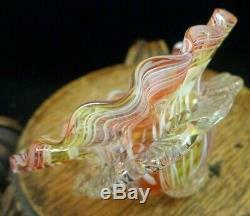 Does not surface often, and Rainbow coloured glass has become highly sought after by collectors. 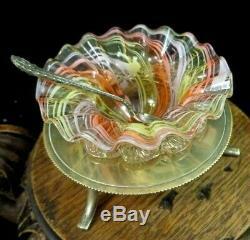 This art glass master salt is either English or Bohemian and is from the end of the Victorian era. 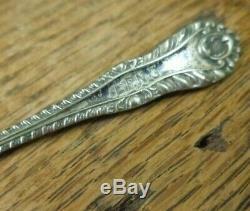 The silverplated holder and spoon are both stamped with EPNS. 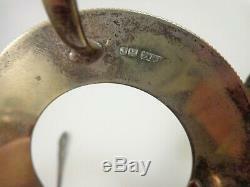 The silverplated holder also has hallmark initials, JH which is unidentified. Possibly from the Sheffield region. 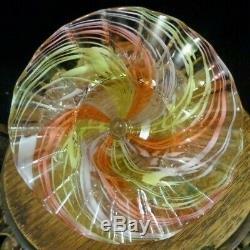 The rainbow glass master salt 1-3/4 tall. The rim is 3 diameter. The epns stand is 1-1/8" tall and the rim is 3-3/8" diameter. The tripod footed base is 3-5/8 diameter. 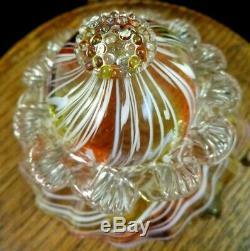 Please view my other listing for other antique glass collectibles. 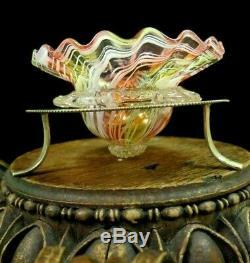 The item "Antique Victorian RAINBOW Art Glass Master Salt w Silver Plated Holder & Spoon" is in sale since Wednesday, March 13, 2019. 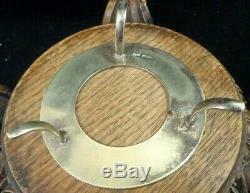 This item is in the category "Antiques\Silver\Silverplate\Other Antique Silverplate". 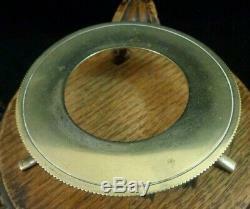 The seller is "goodwinantiques" and is located in Preston, Maryland. This item can be shipped worldwide.